Originally used to furnish the Paulistano Athletics Club in Sao Paolo, this chair, designed by the famous architect Paulo Mendes da Rocha in 1957, has quickly become a classic of Brazilian design. Its constructivist design, composed of a single piece of steel tubing, and leather seat lend this chair aesthetic lightness and incomparable comfort. Paulistano impresses by its design and modernism as well as by the beauty of its lines, that confer upon it simplicity, elegance and a feeling of wellbeing. Produced in small limited series over the years (there are only around 350 worldwide), it has improved with age and proved that the purity of its lines are timeless: a masterpiece. In partnership with Paulo Mendes da Rocha, Objekto decided to re-market this chair so that it would no longer be only an object coveted by collectors but accessible to all. Available with a polished stainless steel frame (as in photo opposite) or in phosphated carbon. 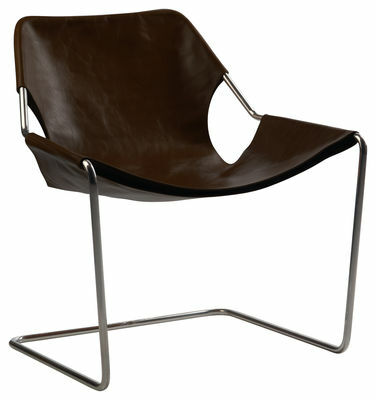 The superb leather seat is available in macassar, cognac, black, chocolate, whisky, orange and white.